happy tuesday confident crafters, hope you all had a great and restful weekend! and i have to admit i'm going to be pretty sad to have to see it end! on what it means to think like a crafter. being able to see the possibilities for something greater in plain old everyday things. when i wanted to have cute trendy things, but didn't really have the cash to make that happen. and then break out the needle, thread, modge podge, and magazines. just made me feel so crafty fabulous! has continued to be a really important part of my life, and why i craft. i've learned how to look at things through my "crafting eyes"
to try and see the possibilities beyond the obvious. an oversized men's shirt? how about a dress for myself? an empty tin can? how about a pencil holder for my desk? but i think that my time reusing and restyling really helped me to learn how to think like a crafter. 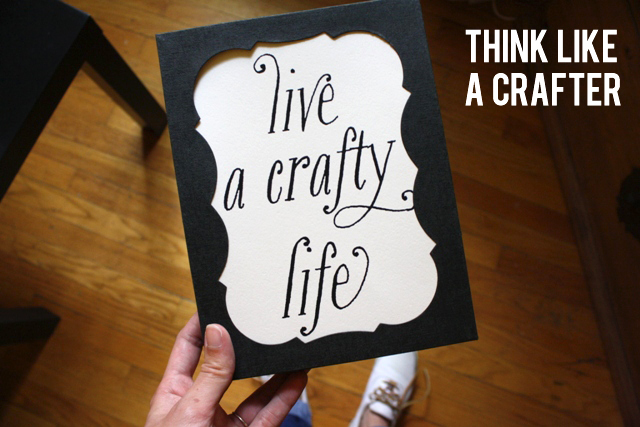 what do you think it means to think like a crafter? the world around you more beautiful? I used to hate window shopping until I realized it helped me get ideas. It's so easy to look at items in the store and see that it wouldn't be that hard to make. I used to think, "oh, I can't afford that." Now I think, "I like that....how is it constructed? How could I make my own affordable version?" oh hilary, i LOVE this! i do this all the time, just window shop to get ideas on things to make. i think that's a great way to practice thinking like a crafter. you go girl! !